The catalyst today to burst these and other asset bubbles is the Federal Reserve’s recent interest rate hikes. The Fed has already raised the Fed funds rate three times since December 2015. While it may not seem like a big move, the increase in the Fed funds rate from 12.5 to 91 basis points in the last 16 months equates to a 628% increase in the interest cost of borrowing Fed funds. Foreign banks are the largest Fed funds borrowers illustrating the Fed’s global impact. By starting from such a low rate, as is evident in our log-scaled chart shown in Figure 1, it’s the largest Fed funds rate hike in any past US business cycle, and it has come late in the economic cycle. 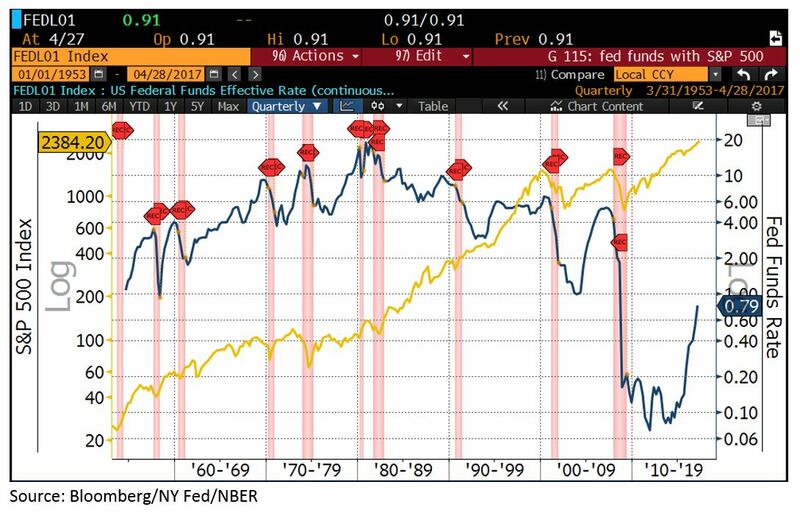 Figure 1 shows the Fed funds rate in blue and the S&P 500 Index in gold over the current and prior nine US business cycles since inception of the Fed funds rate in 1954. We have log scaled the y-axes to visualize the “percentage change” in the Fed funds rate as well as in the S&P 500 over time. Recessions are highlighted in red. As Figure 1 illustrates, in all prior cycles, a high rate-of-change increase in the Fed funds rate, late in the business cycle, coincided with or soon led to a credit crisis, stock market crash, and recession every time. Why should it be any different this time? Sure, tax cuts should eventually prove bullish, but when it comes to political regime change late in the business cycle, there is a much bigger, more imminent problem. Based on our study of prior post-World War II Democratic-to-Republican regime changes, there was a stock market crash and recession in the first year of the new Republican president’s term every time. That’s right, every single one: Eisenhower (1953), Nixon (1969), Reagan (1981), and Bush (2001). It’s still early in President Trump’s first year. He only just finished his first 100 days. Yes, even under the great Ronald Reagan who ultimately delivered on his income tax cut, the world could not escape the curse of the stock market crash and recession in the first year of a Republican president. Stocks were looking great for Reagan at the end of his strong first 100 days, but the market faltered in May and then again in June as Fed Chair Paul Volcker pressed the Fed funds rate higher. The recession began in July of Reagan’s first year. The S&P 500 Index declined 27.1% from its post-election high before the recession ended in November 1982. Reagan signed his tax plan into law. Congress named it the “Economic Recovery Tax Act of 1981”. Note the words, “Economic Recovery”, an acknowledgement that the economy was already in recession by August of 1981 as the bill became law. It helped to have an economic crisis early in Reagan’s presidency to get the tax deal done. A crisis that happens early in a new president’s term can always be blamed on the prior administration. With the push for tax cuts and deregulation and optimism already baked into the stock market today, the Republican administration, Congress, and the markets are all goading the Fed to hike rates further, just like under Reagan and Volcker. The Fed still plans on two more hikes this year, and the Fed funds futures market is paving the way for at least one hike more in June. The current expansion phase of the business cycle is more than eight years running. According to the National Bureau of Economic Research (NBER), the non-partisan academic think tank, there have been eleven business cycles in the US from 1945 to 2009. The average length is 5.8 years. The average expansion phase was 4.8 years while the average contraction was 0.9 years. NBER is an army of more than 1,400 economics professors including 26 Nobel Prize winners, the authority on business cycles and recessions. Bottom line, if we go by the NBER average business cycle length, the current expansion has already gone on 65% longer than the average expansion and is due for a downturn, particularly now that the Fed is raising rates at a high rate-of-change and that we are in the first year of a Republican presidency. The two longest running business cycles next to the current one, extended as far as a ninth year, but their demise finally occurred in 1969 and in 2001. These years coincided with the Fed raising interest rates and Richard Nixon and George W. Bush’s first years in office. Speaking of the average length of business cycles, certain astute market practitioners have identified a natural global economic cycle that averages 8.6 years in length. They arrived at 8.6 years because it was the average distance between financial panics over the last three centuries and more. For more information on this cycle, see the link on the pi cycle by Barclay Leib. Based on the pi cycle average, according to Leib, we are due for a financial panic to unfold around May 7, 2017. Coincidentally that is the day of the final French elections, approximately two 8.6-year cycles from the tech bubble peak in 2000 and one 8.6-year cycle from the collapse of Lehman Brothers in 2008. Understanding the extent of the overvaluation in financial assets today is a key part of reading the overall macro cycle, because it is when speculative financial asset bubbles burst that the downturn in the real economy follows. 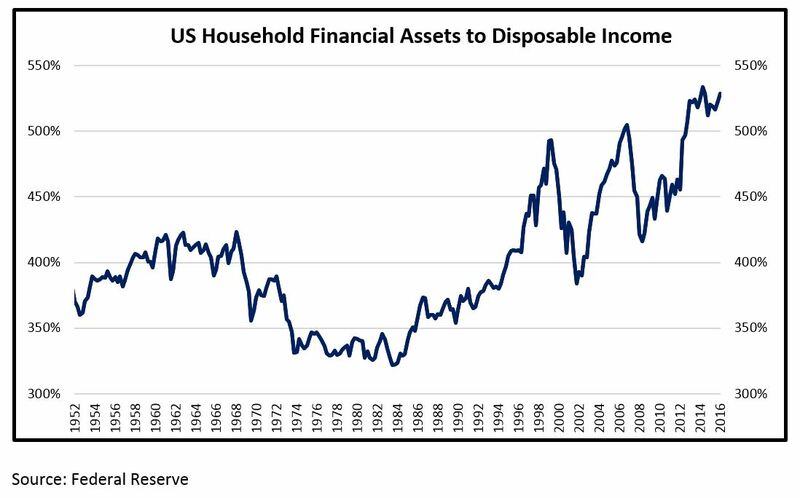 As we show in Figure 2, in the US, the aggregate valuation of financial assets (stocks, bonds, and cash) relative to after-tax income is more overvalued than it was in both the tech bubble and the housing bubble. 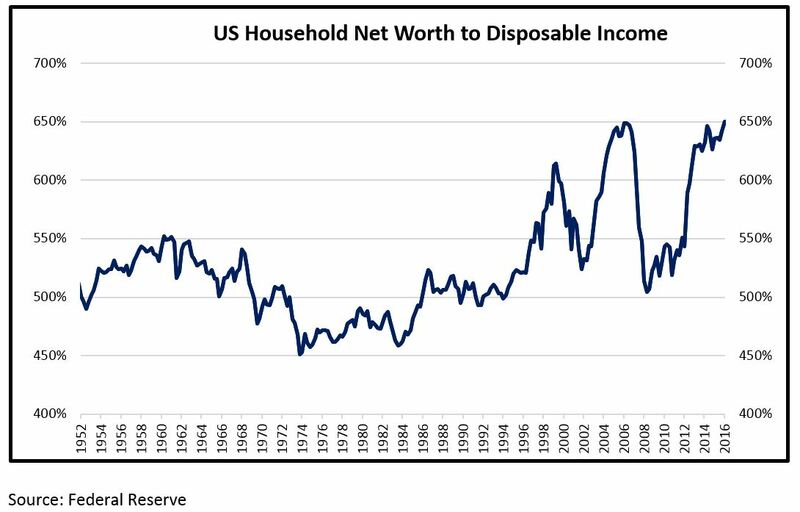 Also, as shown in Figure 3, US household net worth relative to income is also at record valuation levels. This measure also includes real estate. And according to the Organization for Economic Cooperation and Development (OECD), similar record imbalances in the valuation of financial assets and net worth to disposable income currently exist in Europe, Canada, Japan, and the UK. The speculative financial asset bubble in today’s market brought on by record easy central bank policies is a global phenomenon. The Fed is leading the charge globally on ending these easy money policies. 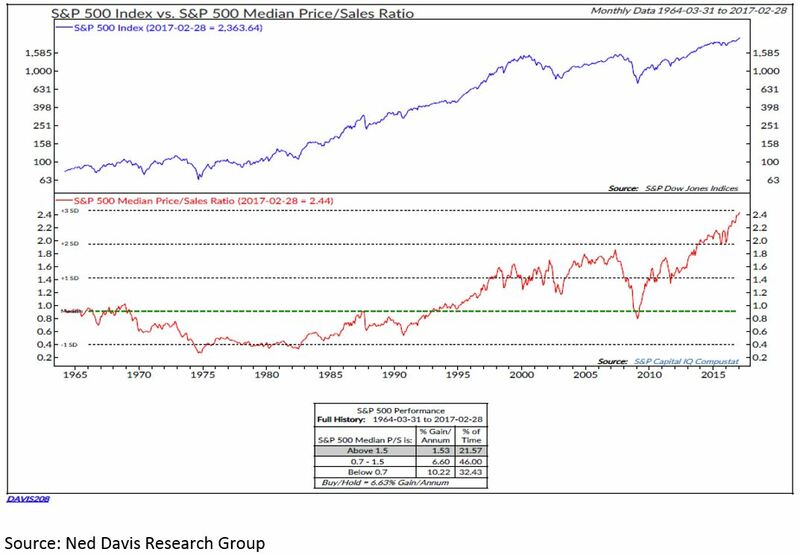 To illustrate the breadth of the valuation bubble in the US equity markets, the median stock in the S&P 500 is at its highest valuation level ever, as shown in Figure 4, higher than the tech and housing bubbles on a price-to-sales basis. Furthermore, median debt-to-assets in the S&P 500 is at its highest levels ever while the profit margin in the S&P 500 has already peaked out. 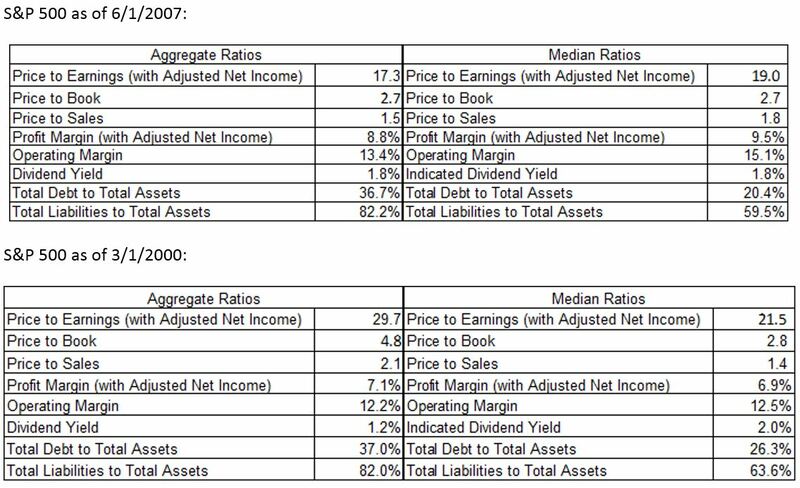 Across a broad swath of valuation measures (see the tables in the appendix) for both the S&P 500 and the Russell 2000, US stock valuations are either in the same range or in many cases significantly higher than they were at the tech bubble peak and the housing bubble peak. Sure, high valuation multiples might theoretically be justified in a low interest rate environment, but we must keep in mind that equities are the lowest asset class on the credit totem pole. Therefore, a generous risk premium or margin of safety must always be applied. If the Fed is raising interest rates in a possibly deliberate attempt to deflate speculative asset bubbles, valuation multiples are highly at risk of contracting. Is an aggregate P/E ratio of 115, as it is today, on the Russell 2000 small-cap index really justified? We don’t think so. In order to see the impact of the Fed’s recent interest rate changes on small cap companies, we studied the Russell 2000 Index since the time the Fed began hiking rates in December of 2015. Since that time, the aggregate P/E ratio of the Russell 2000 has moved up from 46 to 115 times earnings. During the same time, aggregate interest expense has increased by 19% and corporate profits have declined by 33%! 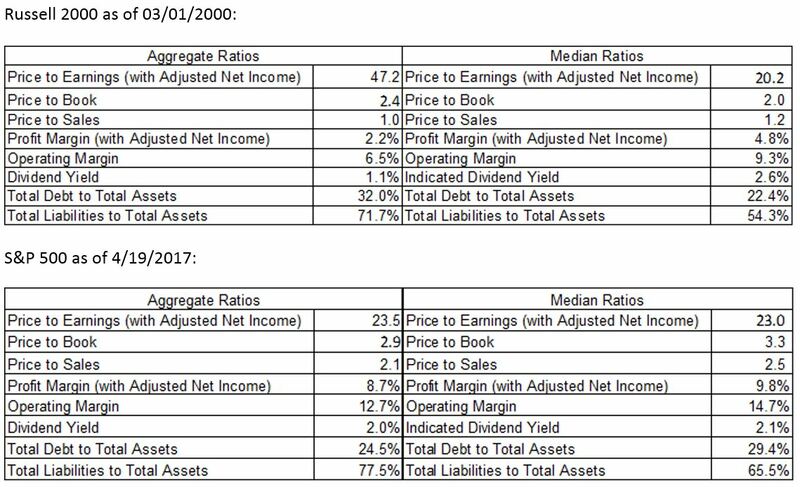 In median terms, Russell 2000 companies are now paying 24% of their operating profits in interest expense. 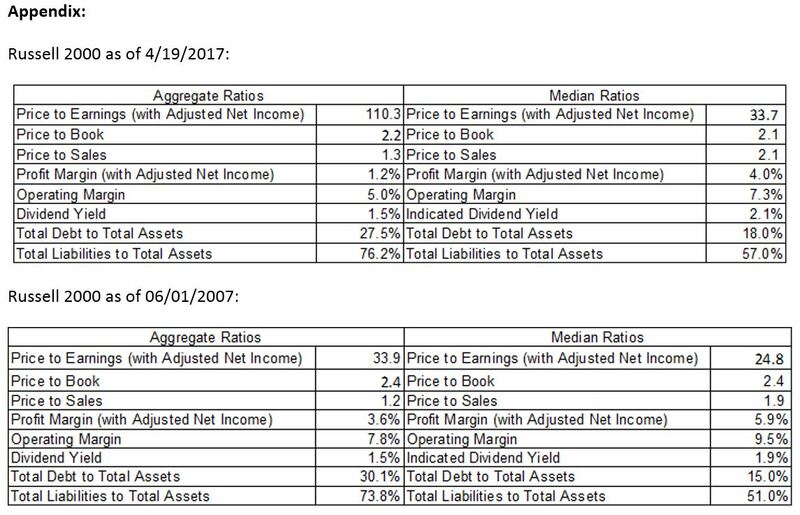 That’s exactly what these companies were paying as a percentage of operating profits at the height of the tech bubble and 10 percentage points more than they were paying prior to the global financial crisis. In the Russell 2000 today, only 68% of the index is made up of profitable companies. At the peak of the tech bubble, 76% of these companies were profitable. At the peak of the housing bubble, 79% of them were profitable. Clearly, for small cap stocks, the valuations are higher today and the fundamentals are weaker than they were at the prior two stock market tops. Stock markets top out when valuations are extended, when corporate earnings and the economy appear strong, and when measures of consumer, business, and stock market sentiment are strong. These conditions are currently in place. We believe that this is as good as it gets. At times like this, everything is set up to fail. The catalyst for failure today is the same as the demise of every US business cycle: The Fed is tightening credit late in the business cycle. According to recent March data from the Yale University Stock Market Confidence Indices, only 1% of institutional investors expect the US stock market to be down over the next year. This is record bullish sentiment from this monthly Yale survey that goes back to 1989. It is also at a record divergence from these investors’ rational valuation assessment of the stock market which is moderately high. Bespoke Investment Group describes it this way, “They know the market is overvalued, but are just waiting for an excuse or a catalyst to bail out.” We think the truth of the Yale surveys is that institutional investors are more record net-long stocks than they are truly aware that market is overvalued. Therefore, it is time to sell stocks now. The catalyst is already in play – the rate of change in the Fed funds interest rate. As further evidence of uber-bullish investor sentiment, the Barron’s twice-annual Big Money Poll that came out just this weekend shows that only 9% of big money managers are bearish through year end, and only 1% expect a recession in 2017. Consumer sentiment measures are also contrarian indicators. The Conference Board’s Consumer Confidence indicator and University of Michigan’s Consumer Sentiment indicators, for instance, have risen throughout this entire economic growth cycle. We saw the same pattern with the US stock market tops in 2000 and 2007 as shown in Figure 5. At late-cycle market tops, investor and advisor sentiment is typically extremely bullish. Such is the case today, indicating that investors are already fully long the market. Professional investors can’t even imagine the market being down over the next year, let alone entering a market crash or recession in the near term. It seems to us that investors are saying to themselves, “Surely tax cuts and less red tape under Trump are bullish for the stock market. Sure, it might be late in the economic cycle, but there is almost certainly one more significant push higher in stocks. I would be a fool to miss that. That would be like missing out on the tech boom in 1999. Sure, valuations are high, but they can go higher. I know the Fed has been hiking rates, but Janet Yellen says monetary policy remains accommodative. And Stanley Fischer says equity volatility is low.” We strongly believe that sentiment and complacency right now is indicative that we are in the price-and-time vicinity of a major cyclical market top. Insider sentiment meanwhile is a confirming rather than contrarian indicator at a market top. As shown in Figure 6, overall insider selling compared to buying, as highlighted by Barron’s recently, has been surging. Such is reminiscent of the tech bubble peak in 2000. Our stance in our last quarterly letter was much more hedged than it is today. We had bought into the idea of a possible late cycle inflection or “reflation trade” and we even came out with a Peak Deflation theme. The facts have changed as our overall macro picture has come more clearly into view. What we see as we have laid out herein is not “reflation”, but rather a significant downturn in the global economic cycle. As we have been saying in our intra-quarter updates, the S&P 500 Index may have already peaked back on March 1, the day after President Trump’s first State of Union address and the day of the pricing of the Snap Inc. IPO, arguably the most richly valued IPO in history. In the last week, the French centrist candidate emerged as the leader after the first round of French presidential elections and more clarity on the Trump tax plan has buoyed the market to a re-test of its March 1 highs. The Nasdaq Composite meanwhile has pushed to new highs. No doubt, the tech-laden NASDAQ Composite has been the leader in this market. But despite tech’s strength, a potential double-top has just formed in the S&P 500 Index with the intra-day reversal day on April 26. The highs on that day were just below the March 1 highs and the close that day was below the March 1 close followed by two weaker days, highlighting the possibility of an imminent breakdown. For now, March 1 is still the closing high in the S&P 500, but even if it is breached, it would do little to change the overall macro-cyclical and fundamental valuation outlook highlighted in this letter which signals strong caution for the late-cycle bulls. We hold record cash and precious metals in our long-only strategy because we are genuinely bearish right now and care deeply about protecting capital for our clients. We will continue to look for defensive and counter-cyclical ways to deploy this cash with the goal of making money in the upcoming bear market in our long-only strategy. Furthermore, we intend to capitalize on the next downturn in our hedge funds, where unlike many hedge funds today, we employ significant short selling, and are currently net short equities. We still have some long hedges in our hedge funds to be sure, but we are currently as net short in equities as we have ever been. Fed funds rate hikes usually have major ripple effects through the whole the global credit system. Equities and a broad range of credit instruments are highly at risk of a correction in today’s global markets. With the Fed raising its funds rate, foreign banks today are highly at risk. They are the largest borrowers in the Fed funds markets. Such banks include Australian and Canadian banks that have also issued substantial dollar-denominated bonds. In other words, the US credit markets have been the fuel for the Australian and Canadian housing bubbles. Mortgage originator Home Capital Group plunged 58% last week, signaling that the Canadian housing bust may already be underway. Rising Fed funds combined with the declining Australian and Canadian dollars spells trouble for Australian and Canadian banks. We are short these banks in our hedge funds. The housing bubbles in Australia and Canada are the product of capital outflows from China, a country that is plausibly at the peak of a historic economic boom. The Fed rate hikes, we strongly believe, are putting devaluation pressure on the Chinese yuan. We have written extensively about the currency and credit bubble in China in prior quarterly letters. We have had fits and starts with the yuan devaluation, but haven’t seen anything yet in terms of the big move that we are expecting. When the Chinese currency finally breaks, we are looking for a 30%+ devaluation. At that point, the Australian and Canadian housing bubbles will have already burst. Global asset bubbles of all kinds are now poised to unwind courtesy of the recent Fed rate hikes. We hope to have shown herein, that there is indeed a business cycle. Contrary to some investment philosophies that claim it is too hard to time the business cycle or that macro is not a worthy part of a part of value-oriented investment discipline, in our experience that is pure nonsense. That is industry propaganda to keep long-only investors from pulling their money out ahead of or during a downturn. While the business cycle may not be easy to time, it is something that we believe is well worth the effort. 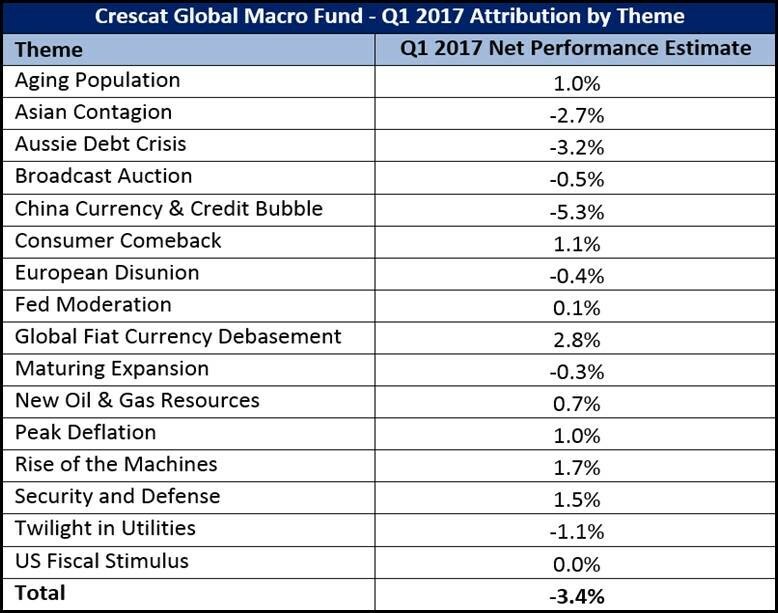 As a recent example, when the global economic growth and business cycle first started to crack surrounding the first Fed interest rate hike in December 2015, Crescat was ready. Starting with just the anticipation of the first Fed increase, China and the global oil industry went into crisis mode. The S&P 500 Index had a 14% correction from July 2015 to February 2016. The Shanghai Composite crashed almost 47% from its high in June 2015 to its low in January 2016. Crescat capitalized on this environment. 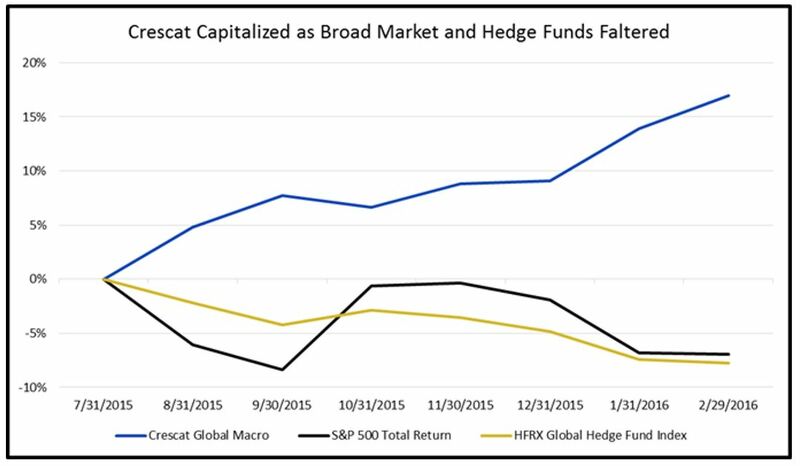 In our global macro fund, from July 2015 to February 2016, Crescat Global Macro Fund was up 17.0% net compared to a 7.0 percent decline in the S&P 500, and an 8.8% decline in the HFRX Global Hedge Fund index. As shown in Figure 7, Crescat generated strong alpha and low correlation to other funds and the market because we were ready for this environment based on our macro themes and positioning. We are not perma-bears by any means. We do not buy into the secular stagnation story. We buy into the idea of an imminent cyclical downturn. We care about our clients, so we invest based on our research and our convictions. Our goal is to grow and protect capital through the entire business cycle. We have been able to do so over time very well compared to the markets and most of our competitors. Short-term drawdowns are part of the game. We appreciate our loyal, long-term clients. Those who have the wherewithal to get in after one of our short-term drawdowns could be rewarded handsomely. For those who have been following us for a while and have been waiting to hear the conviction that it is finally a good entry point, please read the letter again and get a sense of our true conviction. We believe the time is now. We believe our outperformance as shown in Figure 7 is a taste of what is to come at Crescat when the US business cycle turns down for real. We cannot pinpoint exact dates of business cycle downturns. The Fed went on vacation from hiking rates for a year after its first hike started to blow up both China and the oil industry. But the Fed has been hiking again. What we know is that it is late in both the US business cycle and the global economic cycle with speculative asset bubbles abounding. The catalyst is that the Fed is raising rates at a high rate of change. We are also in a highly bearish first-year Republican presidential year and investor sentiment is as exuberantly bullish as we have ever seen it. It is therefore our duty to be bears in this market and to position our clients accordingly. We like defensively-oriented long health care equites that score well in our valuation model. Current holdings include: Alexion Pharmaceutical, Jazz Pharmaceutical, Charles River Laboratories, McKesson, ABBVIE, Gilead Sciences, Centene, Intuitive Surgical, Celgene, Regeneron, Biogen, Amgen. Our Canadian housing bubble shorts are herein. We are short Bank of Nova Scotia, Toronto-Dominion Bank, Bank of Montreal, Royal Bank of Canada, Canadian Imperial Bank of Commerce. We are also short Fortescue Metals, an Australian iron ore producer that exports to China. We are short Australian banks: Commonwealth Bank, Australia & New Zealand Banking Group, National Australia Bank, Westpac Banking, and iShares MSCI Australia. We are long the US Dollar versus Chinese Renminbi (RMB) with three non-deliverable USD-settled call options with JP Morgan and Goldman Sachs as counterparties. We are short RMB futures on the CME, the Chicago futures market. We are short Chinese equity and banks through ETFs: iShares China Large Cap, iShares MSCI China, Deutsche X-Trackers Harvest CSI-300 A-Share. We are long the British pound, as the short side of this trade became very crowded. We are also short iShare MSCI United Kingdom. We are out of our short euro position short for now. As expected based on this letter, we believe the risks of being long financials outweigh the bullish factors we outlined in previous recent quarterly letters. We sold our long US banks several weeks ago as the reflation trade evaporated. We are still long two insurers supported by our model, Travelers and Everest Re. We are long gold futures and have a smaller position in long silver futures. We own precious metals mining equities: Barrick, Newmont Mining, Novagold, Hecla, Pan American Silver, Franco Nevada, Rangold Resources, and Detour Gold. We had to take a break in this theme as it was hurting us when the reflation trade was on. The theme is back! We did well on the long side with semiconductors for several years, but we think the semi-cycle has peaked. We now own put options on VanEck Vectors Semiconductor (SMH). We are short Intel, Advance Micro Devices, and Cavium. We are short auto- and transport-related stocks: CarMax, Lithia Motors, AutoNation, O Reilly Automotive, AutoZone, Avis, Advanced Auto Parts, Ryder, FedEx, United Parcel Service. We are short SNAP Inc, Roper Technologies, and Royal Caribbean Cruises. Our Consumer Comeback has evolved into the Millennial Wave. Some believe that millennials are our only hope for growth against the otherwise secular stagnation caused by the aging population. Millennials are getting older, have jobs, and are starting to buy homes. After the next downturn, the growing and maturing millennial generation will combine with cyclical market forces and lead to growth. We are long homebuilding stocks in this theme that are strongly supported by our model: PulteGroup, Lennar, MDC Holdings, and KB Home. We are also long Southwest Airlines, Louisiana-Pacific, and Electronic Arts. Homebuilders are either late cycle or possibly counter-cyclical plays as they were in the early 2000s. Our model was great at timing them on the long side in early 2000s and on the short side starting in 2006. We shorted them all from the top in 2006 and they helped us to nail the housing bust. The shale production boom was driven less by engineering advances and more by Wall Street hype and easy money. High costs and precipitous production decline rates caused billions in mal-investment. The shale-oil bust, China bust, and Australian/Canada housing busts should all feature strongly when looking back and trying to name the 2017 recession. Strongly supported by our time-tested fundamental equity model, we are short crude oil futures, BOK Financial, RSP Permian, Oasis Petroleum, Diamondback Energy, Russia Vectors ETF, SM Energy, Resolute Energy, Matador Resources, Whiting Petroleum, SPDR Oil & Gas Exploration, Tenaris, Concho Resources, Pioneer Natural Resources, Cullen/Frost Bankers, Laredo Petroleum. We have small long hedges on the natural gas side with long-dated natural gas futures and Cabot Oil and Gas. Let’s face it, artificial intelligence (AI) is for real, but it has also become a bubble in the short run. When Intel paid up for Mobileye, that was it for us, top of the semi-cycle. We sold a huge winner, Nvidia, which is still a great company, and other of our AI plays. We still own Alphabet and Microsoft. We might get back into Apple if looking for more long hedges. Cyber-security themes and defense stocks could do well on the long side in a bear market. Defense spending is likely to keep ramping up under the Trump administration after a decade of stagnation. There is no doubt about rising geopolitical tensions in North Korea, Syria, Turkey, Iran, China, and Russia. Valuations in defense stocks are reasonable considering future counter-cyclical growth. We are long Huntington Ingalls, Fortinet, Check Point Software, Boeing, FLIR Systems, General Dynamics, Lockheed Martin, Northrop Grumman, Raytheon, and Juniper Networks. It is no surprise that our short themes have been holding us back recently. The short themes are there for good reason as we have laid out herein. By having some long hedges and following our risk controls, our shorts have hurt us but have not killed us. We are still alive to fight the good fight. We are ready for the downturn in the economic cycle to really get going, when many other bears have capitulated. We believe our time to shine once again is coming soon. Case studies are included for informational purposes only and are provided as a general overview of our general investment process, and not as indicative of any investment experience. There is no guarantee that the case studies discussed here are completely representative of our strategies or of the entirety of our investments, and we reserve the right to use or modify some or all of the methodologies mentioned herein. Only accredited investors and qualified clients will be admitted as limited partners to a Crescat fund. For natural persons, investors must meet SEC requirements including minimum annual income or net worth thresholds. Crescat funds are being offered in reliance on an exemption from the registration requirements of the Securities Act of 1933 and are not required to comply with specific disclosure requirements that apply to registration under the Securities Act. The SEC has not passed upon the merits of or given its approval to the Crescat funds, the terms of the offering, or the accuracy or completeness of any offering materials. A registration statement has not been filed for any Crescat fund with the SEC. Limited partner interests in the Crescat funds are subject to legal restrictions on transfer and resale. Investors should not assume they will be able to resell their securities. Investing in securities involves risk. Investors should be able to bear the loss of their investment. Investments in the Crescat funds are not subject to the protections of the Investment Company Act of 1940. Performance data represents past performance, and past performance does not guarantee future results. Performance data is subject to revision following each monthly reconciliation and annual audit. Current performance may be lower or higher than the performance data presented. Crescat is not required by law to follow any standard methodology when calculating and representing performance data. The performance of Crescat funds may not be directly comparable to the performance of other private or registered funds. 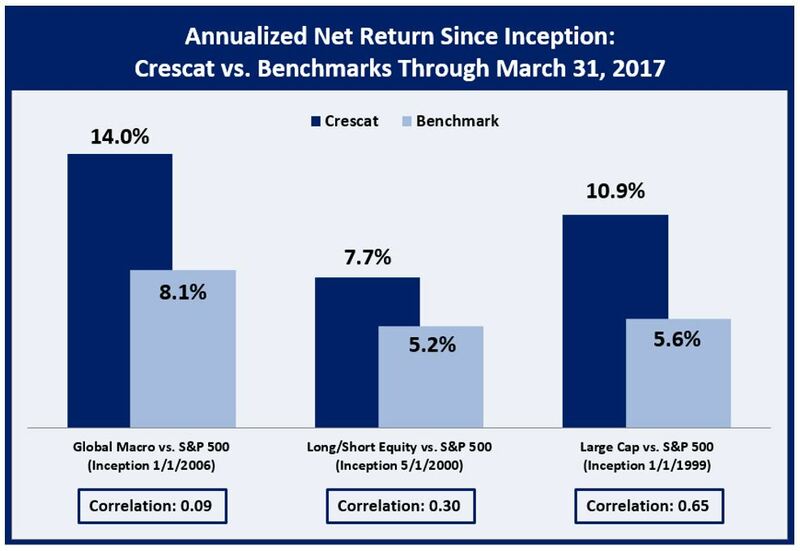 Investors may obtain the most current performance data and private offering memorandum for a Crescat fund by contacting Linda Smith at (303) 271-9997 or by sending a request via email to info@crescat.net. See the private offering memorandum for each Crescat fund for complete information and risk factors.